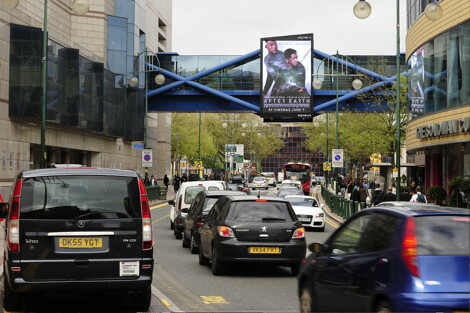 Heinz, Coca-Cola, Stella Artois, 20th Century Fox and Sony Pictures are among the first advertisers on two new CityVision Broad Street displays for Signature Outdoor in Birmingham, England. Dynamic Digital Displays Europe, the European Headquarters of D3, delivered the two new large format LED displays at a high-traffic thoroughfare in the City, secured to opposite sides of a pedestrian bridge that links the Hyatt Hotel and the International Convention Centre. Suspended 7 metres above flowing traffic and pedestrians, the 6m x 4m portrait displays are comprised of 432 10mm SMD LED modules in total and have a unique patented louver design that provides extreme viewing angles to the audience below. Broad Street is recognised as one of Birmingham’s busiest and most popular entertainment, leisure and business destinations and has become a popular area in the City for advertisers. Broad Street has four main roads leading into it, which together bring a combined average daily traffic count of over 133,700 vehicles (according to the UK Department for Transport). Signature Outdoor, a Birmingham-based media operator, holds a ten-year contract with Birmingham City Council for the regional CityVision digital network, which will enable Council-owned prime advertising locations to be used as revenue-generating assets. Once completed, the CityVision network will be comprised of eight displays in total, and it will raise at least £1.3 million a year for the City Council. This entry was posted on Tuesday, July 16th, 2013 at 08:37 @401 and is filed under DailyDOOH Update. You can follow any responses to this entry through the RSS 2.0 feed. You can leave a response, or trackback from your own site.